Our range of MS Channels including Industrial MS Channel, Construction MS Channel, Steel MS Channel are used in wide array of applications. These Channels are one of the most commonly used roll formed metal parts. 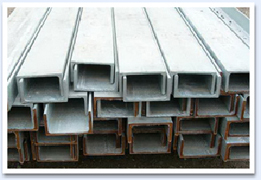 One of the most common types of Steel Channels is U-Channels and C-Channels. These are commonly used in various fabrication industries.